Down here at the tip of the Baja California peninsula, I have stumbled across an pre-Hispanic chile pepper soup that uses river stones as the heat for cooking. 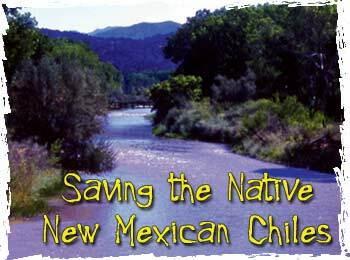 The Chinoteco tribe of Pueblo San Felipe Usila was a fishing based culture, and their fishermen used pear-shaped guajes, or gourd pots, told hold their fresh water while ocean fishing. 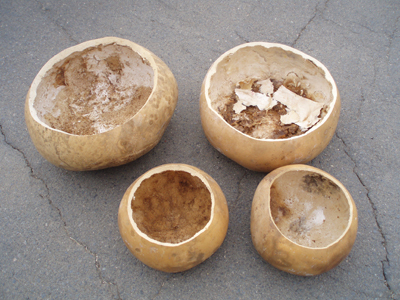 But after the catch, they used guajes cut in half to make bowls for cooking their fish chowder because the gourds of course, could not be placed over an open flame. They heated up smooth stones in a fire to accomplish this according to the recipe below. Totally ingenious, and you can replicate it today! The “river stones” used to cook the soup are smooth stones, usually polished over centuries by moving water, that are about four inches wide and two inches thick. Similar stones are sold by nurseries as garden decorations. Use your barbecue grill to heat the stones as hot as you can get them and use long tongs with wooden handles to transfer them to the cooking bowl. Mix all of the soup ingredients except the water or broth in a large bowl, and then divide it evenly among the 6 bowls. Add the water or broth until each bowl is 3/4 full. Add a stone to each bowl and let the soup boil for 4 to 5 minutes. Remove the stones and serve the soup carefully.